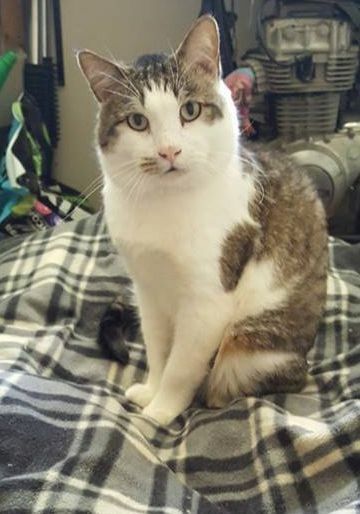 Morley was abandoned, dropped out of a car passing through a mobile home park in north Lethbridge in the summer of 2012. 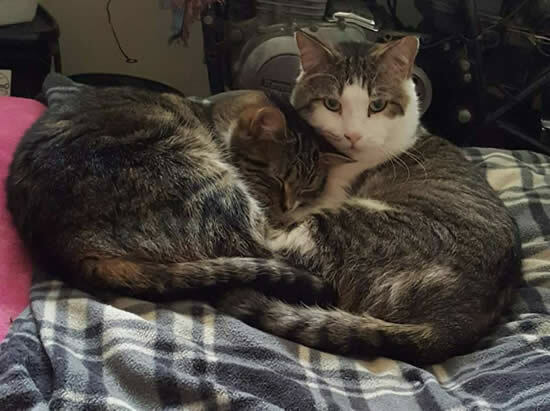 At the time, a park resident was caring for a small stray cat colony, providing them with food and shelter and arranging veterinary care; the new boy was attended to as well. One year old Morley did his best to assimilate with the colony cats, but a couple of the mature males perceived him as a threat and Morley suffered several beatings. When there was room, the Last Chance Cat Ranch accepted him into their foster system. But he struggled in foster care too. He wasn't happy. His foster mom began to notice he was becoming quite jowly which was strange because young, castrated male cats do not develop tom-cat cheeks. Morley was subsequently examined by another veterinarian who determined that an undescended testicle was the likely cause of his issues. Exploratory surgery resulted in the discovery and removal of a testicle in his abdomen. Life changed dramatically for Morley after that. He recovered well, his jowls went back to normal and he mellowed around the other cats. The PAW Society was asked to add him to our adoptable cats and we are happy to help find this nice boy a permanent home. We don't use the designation 'bonded pair' without careful consideration. 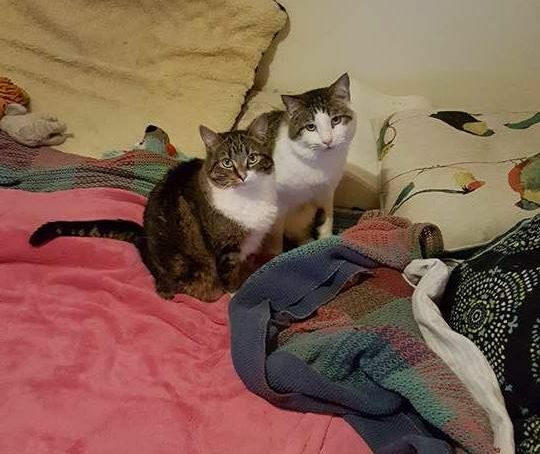 It can take longer to find a home for two; however, for Morley and Isobel, we feel strongly that keeping them together is in their best interests - especially hers. Because she is shy, and that will change as the years go by, we will waive her adoption fee. Have you ever wished for a soul-mate? 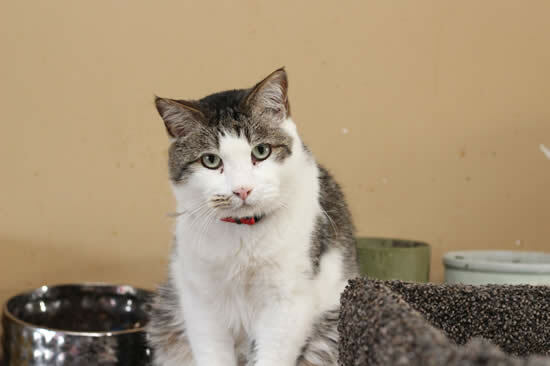 Morley could be your dream kitty. He has so many lovely attributes: loyal, kind, gentle and affectionate. "Always needs to rub, touch and burrbles constantly" says his rescuer. He's part of a package deal. 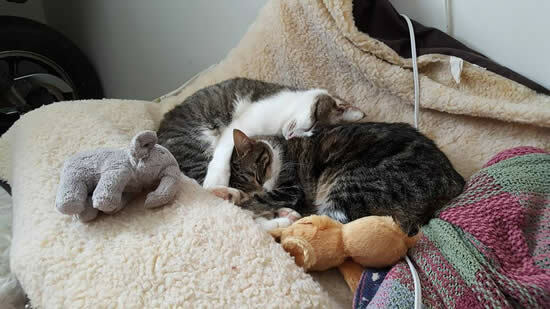 He has a bonded friend, Isobel, who is never far from his side (below). Their relationship is very sweet and she doesn't let him out of her sight. Although Morley loves her, he has room in his heart for much more. He'll want to cuddle with you, sleep with you, welcome you home and listen to all you have to say. He is very aware of what's going on in his environment - a very intelligent gentleman to say the least. You are welcome to fill out an Adoption inquiry here. All adoptions are done on a trial basis which means you would have an agreed upon amount of time to get to know your temporary guests before a final decision is made.